Not to be confused with Nizhny Novgorod. "Novgorod" redirects here. For other uses, see Novgorod (disambiguation). Veliky Novgorod (Russian: Вели́кий Но́вгород, IPA: [vʲɪˈlʲikʲɪj ˈnovɡərət]), also known as Novgorod the Great, or Novgorod Veliky, or just Novgorod, is one of the oldest and most important historic cities in Russia, which serves as the administrative center of Novgorod Oblast. It is situated on the M10 federal highway connecting Moscow and Saint Petersburg. The city lies along the Volkhov River just downstream from its outflow from Lake Ilmen. UNESCO recognized Novgorod as a World Heritage Site in 1992. Population: 218,717 (2010 Census); 216,856 (2002 Census); 229,126 (1989 Census). At its peak during the 14th century, the city was the capital of the Novgorod Republic and one of Europe's largest cities. The Sofia First Chronicle makes initial mention of it in 859, while the Novgorod First Chronicle first mentions it in 862, when it was purportedly already a major Baltics-to-Byzantium station on the trade route from the Varangians to the Greeks. The Charter of Veliky Novgorod recognizes 859 as the year when the city was first mentioned. Novgorod is traditionally considered to be the cradle of Russian statehood. Archaeological excavations in the middle to late 20th century, however, have found cultural layers dating back only to the late 10th century, the time of the Christianization of Rus' and a century after it was allegedly founded, suggesting that the chronicle entries mentioning Novgorod in the 850s or 860s are later interpolations. Archaeological dating is fairly easy and accurate to within 15–25 years, as the streets were paved with wood, and most of the houses made of wood, allowing tree ring dating. The Varangian name of the city Holmgård or Holmgard (Holmgarðr or Holmgarðir) is mentioned in Norse Sagas as existing at a yet earlier stage, but the correlation of this reference with the actual city is uncertain. Originally, Holmgård referred to the stronghold, now only 2 km (1.2 miles) to the south of the center of the present-day city, Rurikovo Gorodische (named in comparatively modern times after the Varangian chieftain Rurik, who supposedly made it his "capital" around 860). Archaeological data suggests that the Gorodishche, the residence of the Knyaz (prince), dates from the mid-9th century, whereas the town itself dates only from the end of the 10th century; hence the name Novgorod, "new city", from Old Church Slavonic Новъ and Городъ (Nov and Gorod), although German and Scandinavian historiography suggests the Old Norse term Nýgarðr, or the Old High German term Naugard. First mention of this Nordic or Germanic etymology to the name of the city of Novgorod (and that of other cities within the territory of the then Kievan Rus') occurs in the 10th-century policy manual De Administrando Imperio by Byzantine emperor Constantine VII. Slightly predating the chronology of the legend of Rurik (which dates the first Norse arrival in the region around 858–860), an earlier record for the Scandinavian settlement of the region is found in the Annales Bertiniani (written up until 882) where a Rus' delegation is mentioned as having visited Constantinople in 838 and, intending to return to the Rus' Khaganate via the Baltic Sea, were questioned by Frankish Emperor Louis the Pious at Ingelheim am Rhein, where they said that although their origin was Swedish, they had settled in Northern Rus' under a leader whom they designated as chacanus (the Latin form of Khagan, a title they had likely borrowed from contact with the Avars). In 882, Rurik's successor, Oleg of Novgorod, conquered Kiev and founded the state of Kievan Rus'. Novgorod's size as well as its political, economic, and cultural influence made it the second most important city in Kievan Rus'. According to a custom, the elder son and heir of the ruling Kievan monarch was sent to rule Novgorod even as a minor. When the ruling monarch had no such son, Novgorod was governed by posadniks, such as the legendary Gostomysl, Dobrynya, Konstantin, and Ostromir. Of all their princes, Novgorodians most cherished the memory of Yaroslav the Wise, who sat as Prince of Novgorod from 1010 to 1019, while his father, Vladimir the Great, was a prince in Kiev. Yaroslav promulgated the first written code of laws (later incorporated into Russkaya Pravda) among the Eastern Slavs and is said to have granted the city a number of freedoms or privileges, which they often referred to in later centuries as precedents in their relations with other princes. His son, Vladimir, sponsored construction of the great St. Sophia Cathedral, more accurately translated as the Cathedral of Holy Wisdom, which stands to this day. In Norse sagas the city is mentioned as the capital of Gardariki. Four Viking kings—Olaf I of Norway, Olaf II of Norway, Magnus I of Norway, and Harald Hardrada—sought refuge in Novgorod from enemies at home. No more than a few decades after the 1030 death and subsequent canonization of Olaf II of Norway, the city's community had erected in his memory Saint Olaf's Church in Novgorod. The Gotland town of Visby functioned as the leading trading center in the Baltic before the Hansa League. At Novgorod in 1080, Visby merchants established a trading post which they named Gutagard (also known as Gotenhof). Later, in the first half of the 13th century, merchants from northern Germany also established their own trading station in Novgorod, known as Peterhof. At about the same time, in 1229, German merchants at Novgorod were granted certain privileges, which made their position more secure. In 1136, the Novgorodians dismissed their prince Vsevolod Mstislavich. The year is seen as the traditional beginning of the Novgorod Republic. The city was able to invite and dismiss a number of princes over the next two centuries, but the princely office was never abolished and powerful princes, such as Alexander Nevsky, could assert their will in the city regardless of what Novgorodians said. The city state controlled most of Europe's northeast, from lands east of today's Estonia to the Ural Mountains, making it one of the largest states in medieval Europe, although much of the territory north and east of Lakes Ladoga and Onega was sparsely populated and never organized politically. One of the most important local figures in Novgorod was the posadnik, or mayor, an official elected by the public assembly (called the Veche) from among the city's boyars, or aristocracy. The tysyatsky, or "thousandman", originally the head of the town militia but later a commercial and judicial official, was also elected by the Veche. Another important local official was the Archbishop of Novgorod who shared power with the boyars. Archbishops were elected by the Veche or by the drawing of lots, and after their election, were sent to the metropolitan for consecration. While a basic outline of the various officials and the Veche can be drawn up, the city-state's exact political constitution remains unknown. The boyars and the archbishop ruled the city together, although where one official's power ended and another's began is uncertain. The prince, although his power was reduced from around the middle of the 12th century, was represented by his namestnik, or lieutenant, and still played important roles as a military commander, legislator and jurist. The exact composition of the Veche, too, is uncertain, with some historians, such as Vasily Klyuchevsky, claiming it was democratic in nature, while later scholars, such as Marxists Valentin Ianin and Aleksandr Khoroshev, see it as a "sham democracy" controlled by the ruling elite. In the 13th century, Novgorod, while not a member of the Hanseatic League, was the easternmost kontor, or entrepôt, of the league, being the source of enormous quantities of luxury (sable, ermine, fox, marmot) and non-luxury furs (squirrel pelts). Throughout the Middle Ages, the city thrived culturally. A large number of birch bark letters have been unearthed in excavations, perhaps suggesting widespread literacy, although this is uncertain (some scholars[who?] suggest that a clerical or scribal elite wrote them on behalf of a largely illiterate populace). It was in Novgorod that the Novgorod Codex, the oldest Slavic book written north of Bulgaria, and the oldest inscription in a Finnic language (Birch bark letter no. 292) were unearthed. Some of the most ancient Russian chronicles (Novgorod First Chronicle) were written in the scriptorium of the archbishops who also promoted iconography and patronized church construction. The Novgorod merchant Sadko became a popular hero of Russian folklore. Novgorod was never conquered by the Mongols during the Mongol invasion of Rus. The Mongol army turned back about 200 kilometers (120 mi) from the city, not because of the city's strength, but probably because the Mongol commanders did not want to get bogged down in the marshlands surrounding the city. However, the grand princes of Moscow, who acted as tax collectors for the khans of the Golden Horde, did collect tribute in Novgorod, most notably Yury Danilovich and his brother, Ivan Kalita. In 1259, Hordes tax-collectors and census-takers arrived in the city, leading to political disturbances and forcing Alexander Nevsky to punish a number of town officials (he cut off their noses) for defying him as Grand Prince of Vladimir (soon to be the khan's tax-collector in Russia) and his Mongol overlords. In the 14th century, raids by Novgorod pirates, or ushkuiniki, sowed fear as far as Kazan and Astrakhan, assisting Novgorod in wars with the Grand Duchy of Moscow. During the era of Old Rus' State, Novgorod was a trade hub at the northern end of both the Volga trade route and the "route from the Varangians to the Greeks" along the Dnieper river system. A vast array of goods were transported along these routes and exchanged with local Novgorod merchants and other traders. The farmers of Gotland retained the Saint Olof trading house well into the 12th century. Later German merchantmen also established tradinghouses in Novgorod. Scandinavian royalty would intermarry with Russian princes and princesses. After the great schism, Novgorod struggled from the beginning of the 13th century against Swedish, Danish, and German crusaders. During the Swedish-Novgorodian Wars, the Swedes invaded lands where some of the population had earlier paid tribute to Novgorod. The Germans had been trying to conquer the Baltic region since the late 12th century. Novgorod went to war 26 times with Sweden and 11 times with the Livonian Brothers of the Sword. The German knights, along with Danish and Swedish feudal lords, launched a series of uncoordinated attacks in 1240–1242. Novgorodian sources mention that a Swedish army was defeated in the Battle of the Neva in 1240. The Baltic German campaigns ended in failure after the Battle on the Ice in 1242. After the foundation of the castle of Viborg in 1293 the Swedes gained a foothold in Karelia. On August 12, 1323, Sweden and Novgorod signed the Treaty of Nöteborg, regulating their border for the first time. The city's downfall occurred partially as a result of its inability to feed its large population, making it dependent on the Vladimir-Suzdal region for grain. The main cities in the area, Moscow and Tver, used this dependence to gain control over Novgorod. Eventually Ivan III forcibly annexed the city to the Grand Duchy of Moscow in 1478. The Veche was dissolved and a significant part of Novgorod's population was either killed or deported. The Hanseatic League kontor was closed in 1494 and the goods stored there were seized by Muscovite forces. At the time of annexation, Novgorod became the third largest city under Muscovy (with 5,300 homesteads and 25–30 thousand inhabitants in the 1550s;) and remained so until the famine of the 1560s and the Massacre of Novgorod in 1570. In the Massacre, Ivan the Terrible sacked the city, slaughtered thousands of its inhabitants, and deported the city's merchant elite and nobility to Moscow, Yaroslavl and elsewhere. The last decade of the 16th century was a comparatively favorable period for the city as Boris Godunov restored trade privileges and raised the status of Novgorod bishop. The German trading post was reestablished in 1603. During the Time of Troubles, Novgorodians submitted to Swedish troops led by Jacob De la Gardie in the summer of 1611. The city was restituted to Muscovy, a brief six years later, by the Treaty of Stolbovo and only regained a measure of its former prosperity towards the end of the century, when such ambitious buildings as the Cathedral of the Sign and the Vyazhischi Monastery were constructed. The most famous of Muscovite patriarchs, Nikon, was active in Novgorod between 1648 and 1652. The Novgorod Land became one of the Old Believers' strongholds after the Schism. In 1727, Novgorod was made the administrative center of Novgorod Governorate of the Russian Empire, which was detached from Saint Petersburg Governorate (see Administrative divisions of Russia in 1727–1728). This administrative division existed until 1927. Between 1927 and 1944, the city was a part of Leningrad Oblast, and then became the administrative center of the newly formed Novgorod Oblast. On August 15, 1941, during World War II, the city was occupied by the German Army. Its historic monuments were systematically obliterated. The Red Army liberated the city on January 19, 1944. Out of 2,536 stone buildings, fewer than forty remained standing. After the war, thanks to plans laid down by Alexey Shchusev, the central part was gradually restored. In 1992, the chief monuments of the city and the surrounding area were inscribed on the UNESCO World Heritage Site list as the Historic Monuments of Novgorod and Surroundings. In 1999, the city was officially renamed Veliky Novgorod (literally, Great Novgorod), thus partly reverting to its medieval title "Lord Novgorod the Great". This reduced the temptation to confuse Veliky Novgorod with Nizhny Novgorod, a larger city the other side of Moscow which, between 1932 and 1990, had been renamed Gorky, in honor of Maxim Gorky. Veliky Novgorod is the administrative center of the oblast and, within the framework of administrative divisions, it also serves as the administrative center of Novgorodsky District, even though it is not a part of it. As an administrative division, it is incorporated separately as the city of oblast significance of Veliky Novgorod—an administrative unit with status equal to that of the districts. As a municipal division, the city of oblast significance of Veliky Novgorod is incorporated as Veliky Novgorod Urban Okrug. The Millennium of Russia monument (1862), with Saint Sophia Cathedral in the background. The upper row of figures is cast in the round and the lower one is in relief. The city is known for the variety and age of its medieval monuments. The foremost among these is the St. Sophia Cathedral, built between 1045 and 1050 under the patronage of Vladimir Yaroslavich, the son of Yaroslav the Wise (Vladimir is buried in the cathedral along with his mother, Anna). It is one of the best preserved churches from the 11th century. It's also probably the oldest structure still in use in Russia and the first one to represent original features of Russian architecture (austere stone walls, five helmet-like domes). Its frescoes were painted in the 12th century originally on the orders of Bishop Nikita (died 1108) (the "porches" or side chapels were painted in 1144 under Archbishop Nifont) and renovated several times over the centuries, most recently in the nineteenth century. The cathedral features famous bronze gates, which now hang in the west entrance, allegedly made in Magdeburg in 1156 (other sources see them originating from Płock in Poland) and reportedly snatched by Novgorodians from the Swedish town of Sigtuna in 1187. More recent scholarship has determined that the gates were most likely purchased in the mid-15th century, apparently at the behest of Archbishop Euthymius II (1429–1458), a lover of Western art and architectural styles. The Novgorod Kremlin, traditionally known as the Detinets, also contains the oldest palace in Russia (the so-called Chamber of the Facets, 1433), which served as the main meeting hall of the archbishops; the oldest Russian bell tower (mid-15th century), and the oldest Russian clock tower (1673). The Palace of Facets, the bell tower, and the clock tower were originally built on the orders of Archbishop Euphimius II, although the clock tower collapsed in the 17th century and had to be rebuilt and much of the palace of Euphimius II is no longer standing. Among later structures, the most remarkable are a royal palace (1771) and a bronze monument to the Millennium of Russia, representing the most important figures from the country's history (unveiled in 1862). Outside the Kremlin walls, there are three large churches constructed during the reign of Mstislav the Great. St. Nicholas Cathedral (1113–1123), containing frescoes of Mstislav's family, graces Yaroslav's Court (formerly the chief square of Novgorod). The Yuriev Monastery (one of the oldest in Russia, 1030) contains a tall, three-domed cathedral from 1119 (built by Mstislav's son, Vsevolod, and Kyurik, the head of the monastery). A similar three-domed cathedral (1117), probably designed by the same masters, stands in the Antoniev Monastery, built on the orders of Antony, the founder of that monastery. There are now some fifty medieval and early modern churches scattered throughout the city and its surrounding areas. Some of them were blown up by the Nazis and subsequently restored. The most ancient pattern is represented by those dedicated to Saints Pyotr and Pavel (on the Swallow's Hill, 1185–1192), to Annunciation (in Myachino, 1179), to Assumption (on Volotovo Field, 1180s) and to St. Paraskeva-Piatnitsa (at Yaroslav's Court, 1207). The greatest masterpiece of early Novgorod architecture is the Savior church at Nereditsa (1198). In the 13th century, tiny churches of the three-paddled design were in vogue. These are represented by a small chapel at the Peryn Monastery (1230s) and St. Nicholas' on the Lipnya Islet (1292, also notable for its 14th-century frescoes). The next century saw the development of two original church designs, one of them culminating in St Theodor's church (1360–1361, fine frescoes from 1380s), and another one leading to the Savior church on Ilyina street (1374, painted in 1378 by Feofan Grek). The Savior' church in Kovalevo (1345) was originally frescoed by Serbian masters, but the church was destroyed during the war. While the church has since been rebuilt, the frescoes have not been restored. During the last century of the republican government, some new churches were consecrated to Saints Peter and Paul (on Slavna, 1367; in Kozhevniki, 1406), to Christ's Nativity (at the Cemetery, 1387), to St. John the Apostle's (1384), to the Twelve Apostles (1455), to St Demetrius (1467), to St. Simeon (1462), and other saints. Generally, they are not thought[by whom?] to be as innovative as the churches from the previous period. Several shrines from the 12th century (i.e., in Opoki) were demolished brick by brick and then reconstructed exactly as they used to be, several of them in the mid-fifteenth century, again under Archbishop Yevfimy II (Euthymius II), perhaps one of the greatest patrons of architecture in medieval Novgorod. Novgorod's conquest by Ivan III in 1478 decisively changed the character of local architecture. Large commissions were thenceforth executed by Muscovite masters and patterned after cathedrals of Moscow Kremlin: e.g., the Savior Cathedral of Khutyn Monastery (1515), the Cathedral of the Mother of God of the Sign (1688), the St. Nicholas Cathedral of Vyaschizhy Monastery (1685). Nevertheless, the styles of some parochial churches were still in keeping with local traditions: e.g., the churches of Myrrh-bearing Women (1510) and of Saints Boris and Gleb (1586). In Vitoslavlitsy, along the Volkhov River and the Myachino Lake, close to the Yuriev Monastery, a museum of wooden architecture was established in 1964. Over twenty wooden buildings (churches, houses and mills) dating from the 14th to the 19th century were transported there from all around the Novgorod region. Novgorod has connections to Moscow (531 km) and St. Petersburg (189 km) by the federal highway M10. There are public buses to Saint Petersburg and other destinations. The city has direct railway passenger connections with Moscow (Leningradsky Rail Terminal, by night trains), St. Petersburg (Moscow Rail Terminal and Vitebsk Rail Terminal, by suburban trains), Minsk (Belarus) (Minsk Passazhirsky railway station, by night trains) and Murmansk. The city's airports Yurievo and Krechevitsy do not serve any regular flights since the middle 1990s. The nearest international airport is St. Petersburg's Pulkovo, some 180 kilometres (112 miles) north of the city. Local transportation consists of a network of buses and trolleybuses. The trolleybus network, which currently consists of five routes, started operating in 1995 and is the first trolley system opened in Russia after the fall of the Soviet Union. A minor planet, 3799 Novgorod, discovered by the Soviet astronomer Nikolai Stepanovich Chernykh in 1979, is named after the city. ^ According to Article 9 of the Charter of Veliky Novgorod, the symbols of Veliky Novgorod include a flag and a coat of arms but not an anthem. ^ a b Тихомиров, М.Н. (1956). Древнерусские города (in Russian). Государственное издательство Политической литературы. Retrieved June 13, 2012. ^ The Archaeology of Novgorod, by Valentin L. Yanin, in Ancient Cities, Special Issue, (Scientific American), pp. 120–127, c. 1994. Covers, History, Kremlin of Novgorod, Novgorod Museum of History, preservation dynamics of the soils, and the production of Birch bark documents. ^ Crummey, R.O. (2014). The Formation of Muscovy 1300 - 1613. Taylor & Francis. p. 23. ISBN 9781317872009. Retrieved September 10, 2015. ^ Valentin Lavrentyevich Ianin and Mark Khaimovich Aleshkovsky. "Proskhozhdeniye Novgoroda: (k postanovke problemy)," Istoriya SSSR 2 (1971): 32-61. ^ The name Holmgard is a Norse toponym meaning Islet town or Islet grad, and there are various explanations for why they gave this name. According to Rydzevskaya, the Norse name is derived from the Slavic Holmgrad which means "town on a hill" and may allude to the "old town" preceding the "new town", or Novgorod. ^ Городище (in Russian). Великий Новгород. Retrieved March 27, 2013. ^ I. Kh. Garipzanov, The Annals of St. Bertin (839) and Chacanus of the Rhos. Ruthenica 5 (2006) 3–8 sides with the old theory. ^ Gwyn Jones, A History of the Vikings, 2nd ed., London, Oxford University Press, 1984, pp. 249–250. ^ "The Cronicle of the Hanseatic League". european-heritage.org. Retrieved September 10, 2015. ^ Translation of the grant of privileges to merchants in 1229: "Medieval Sourcebook: Privileges Granted to German Merchants at Novgorod, 1229". Fordham.edu. Retrieved July 20, 2009. ^ Michael C. Paul, "The Iaroslavichi and the Novgorodian Veche 1230–1270: A Case Study on Princely Relations with the Veche", Russian History/ Histoire Russe 31, No. 1-2 (Spring-Summer 2004): 39-59. ^ Michael C. Paul, "Secular Power and the Archbishops of Novgorod Before the Muscovite Conquest". Kritika: Explorations in Russian and Eurasian History 8, no. 2 (Spring 2007): 231-270. ^ Michael C. Paul, "Episcopal Election in Novgorod, Russia 1156–1478". Church History: Studies in Christianity and Culture 72, No. 2 (June 2003): 251-275. ^ Janet Martin, Treasure of the Land of Darkness: the Fur Trade and its Significance for Medieval Russia. (Cambridge: Cambridge University Press, 1985). ^ Janet Martin, “Les Uškujniki de Novgorod: Marchands ou Pirates.” Cahiers du Monde Russe et Sovietique 16 (1975): 5-18. ^ a b Kovalenko, Guennadi (2010). Великий Новгород. Взгляд из Европы XV-XIX centuries (in Russian). Европейский Дом. pp. 48, 72, 73. ISBN 9785801502373. ^ Tatiana Tsarevskaia, St. Sophia's Cathedral in Novgorod (Moscow: Severnyi Palomnik, 2005), 3. ^ Tsarevskaia, 14, 19-22, 24, 29, 35. ^ Schmadel, Lutz D. (2003). Dictionary of Minor Planet Names (5th ed.). New York: Springer Verlag. p. 321. ISBN 3-540-00238-3. Дума Великого Новгорода. Решение №116 от 28 апреля 2005 г. «Устав муниципального образования – городского округа Великий Новгород», в ред. Решения №515 от 11 июня 2015 г. «О внесении изменений в Устав муниципального образования – городского округа Великий Новгород». Вступил в силу со дня официального опубликования, но не ранее 1 января 2006 года, за исключением статей, для которых подпунктом 5.1 установлены иные сроки вступления в силу. (Duma of Veliky Novgorod. Decision #116 of April 28, 2005 Charter of the Municipal Formation–Veliky Novgorod Urban Okrug, as amended by the Decision #515 of June 11, 2015 On Amending the Charter of the Municipal Formation–Veliky Novgorod Urban Okrug. Effective as of the day of official publication but not earlier than January 1, 2006, with the exception of the clauses for which subitem 5.1 establishes other dates of taking effect.). Администрация Новгородской области. Постановление №121 от 8 апреля 2008 г. «Об реестре административно-территориального устройства области», в ред. Постановления №408 от 4 августа 2014 г. «О внесении изменений в реестр административно-территориального устройства области». Опубликован: "Новгородские ведомости", №49–50, 16 апреля 2008 г. (Administration of Novgorod Oblast. Resolution #121 of April 8, 2008 On the Registry of the Administrative-Territorial Structure of Novgorod Oblast, as amended by the Resolution #408 of August 4, 2014 On Amending the Registry of the Administrative-Territorial Structure of Novgorod Oblast. ). Новгородская областная Дума. Областной закон №284-ОЗ от 7 июня 2004 г. «О наделении сельских районов и города Великий Новгород статусом муниципальных районов и городского округа Новгородской области и утверждении границ их территорий», в ред. Областного закона №802-ОЗ от 31 августа 2015 г. «О внесении изменений в некоторые областные Законы, устанавливающие границы муниципальных образований». Вступил в силу со дня, следующего за днём официального опубликования. Опубликован: "Новгородские ведомости", №86, 22 июня 2004 г. (Novgorod Oblast Duma. 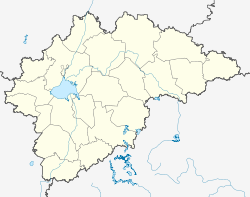 Oblast Law #284-OZ of June 7, 2004 On Granting the Status of Municipal Districts and Urban Okrug of Novgorod Oblast to the Rural Districts and the City of Veliky Novgorod and on Establishing the Borders of Their Territories, as amended by the Oblast Law #802-OZ of August 31, 2015 On Amending Various Oblast Laws Establishing the Borders of the Municipal Formations. Effective as of the day following the day of the official publication.). Государственная Дума Российской Федерации. Федеральный закон №111-ФЗ от 11 июня 1999 г. «О переименовании города Новгорода — административного центра Новгородской области в город Великий Новгород». Вступил в силу со дня официального опубликования. Опубликован: "Собрание законодательства РФ", №24, ст. 2892, 14 июня 1999 г. (State Duma of the Russian Federation. Federal Law #111-FZ of June 11, 1999 On Renaming the City of Novgorod—the Administrative Center of Novgorod Oblast—the City of Veliky Novgorod. Effective as of the day of official publication.). 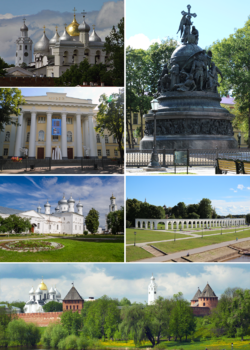 Wikivoyage has a travel guide for Novgorod. Annette M. B. Meakin (1906). "Novgorod the Great". Russia, Travels and Studies. London: Hurst and Blackett. OCLC 3664651. "Novgorod". The Encyclopædia Britannica (11th ed.). New York: Encyclopædia Britannica. 1910. OCLC 14782424.